Welcome to the first of a semi-regular series on "things I'm learning while unemployed." With today marking two weeks since I entered the job market again, I thought it was an excellent time to lead the examined work life. And if you're unemployed -- or once were unemployed -- or might possibly BE unemployed at some point in your life -- then chime in with your thoughts as well! LESSON 1: The milk of human kindness flows like honey (and other mixed metaphors) in times of crisis. People blow me away. I so much as send out one email or tweet, and I get a flood of helpful responses and advice back. LESSON 2: You become your habits, whether you recognize it or not. My work was between my church and my gym. I didn't even have to cross a street to get from one place to another. But now that a very large piece of my daily life was removed from that destination equation, the others are thrown into turmoil. How do I work out if I don't have to go downtown? How do I get to activities at church on time in the evening if I'm not already right there? Do I still get a membership discount? Should I wait to cancel? Should I pull out of volunteering? Point is, you don't realize how many little pieces make up your day-to-day life until you're forced to change them all. And though it might sound odd, this upends my sense of order and stability more than the prospect of months without a paycheck. LESSON 3: Really, don't sweat the small stuff. Or the big stuff. Or the medium stuff. Do it, just don't die for it. I worked some very long hours before Thanksgiving to prepare for our website launch. I faced a lot of stress and agita right when I got back, too. But by Thursday of that week, it didn't matter anymore. Suddenly all these VERY IMPORTANT TASKS were easily shunted off to the remaining people, or deleted, or ignored, or canceled, or rendered meaningless by different decisions. So I had to ask myself, was it worth getting so upset along the way? And that's how I learned that I must strike a better balance between passion and stress. Because the caveat is, all my work COULD have mattered even more. I could have stayed employed, in which case all those balls would still be in play. So I will absolutely always do what I need to do to fulfill my job responsibilities and continue growing. I just won't sacrifice my sanity or health to it. Ok, your turn. 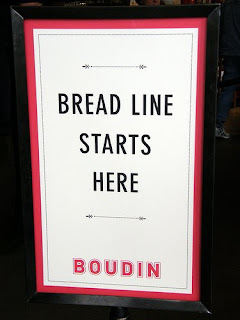 What wisdom have you gleaned from the breadline? Lovely post, Julia, glad I could be of some small assistance. I've been thinking about how nice it is to reconnect with some very basic things lately - like more potluck dinners, playing board games with the kids instead of going to the movies, hand making cards for birthdays, etc. Keep going, you're doing great! After I quit my last job, I spent about 3 months just visiting with friends and family across the country. It was wonderful to have the time to catch up with them and actually be able to spend time with them without any work pressures... and every place I went, I was able to keep myself busy while my host(s) were at work by doing something to help out around the house. At my sister's, I helped clean up and prep the house just before my nephew was born. At another friends place, I put together some Ikea furniture and helped organize book shelves. It was productive work, and it just felt good to do something different for a while. Those few months off really helped restore me, and I think it helped me when I got back into the job market. I refocused and rethought about what I wanted and found a job that was differnt from what I would have been looking for had I started job searching as soon as I left my previous job. I am *much* happier in this job than I have been at any prior job. Good luck... It's good for a (recovering) cynic like me to know that there are such optimistic and positive people in the world. Thanks. VVK: Woohoo, you're in recovery! What awesome tips for getting your head back into the right place -- thanks for that. Perhaps I shouldn't admit this, but heck, we'll all touchy-feely today -- even 'optimistic and positive' I has her grouchy moments, so it's VERY useful to have some extra, proven ideas handy. I'm curious ... what job path are you on now that's making you happier? what job path are you on now that's making you happier? Since I started my first job while in high school, I've worked in two fields, writing software and IT support. After my last job, I was pretty much burned out on IT support. If I had immediately begun looking for another job, I would have given up on the field, and only looked for a software development job. After a few months of not thinking about what I was going to do career-wise, my perspective changed. I realized that my personality being what it was, I would not be happy in a dev job... I realized that I found tremendous satisfaction and joy in helping people... and that it was the other aspects of my prior job(s) in IT support that were the reason I was burnt out - namely the lack of understanding and support from my corporate bosses. This change in perspective gave me the patience and drive to find an IT support job, but one where I have bosses who understand my perspective, and are able to give me the time to do my job well.